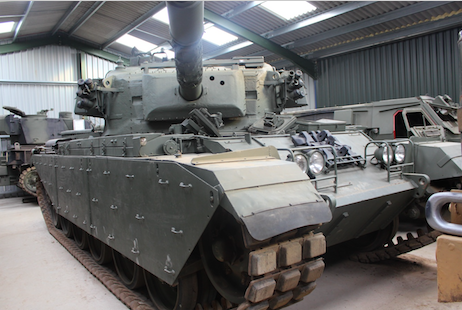 Our museum comprises of a number of weatherproof hangers jam-packed full of military vehicles, guns, cannons and military paraphernalia. The ‘Inner Sanctum’ has a variety of pieces telling of the human side of WWII and a few exhibits from WWI too. 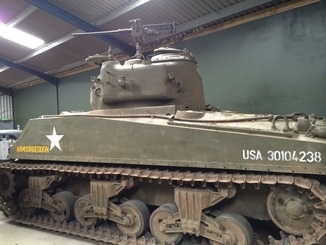 The museum includes a number of tanks used in War-based movies of the last 20 years: Saving Private Ryan, Evita, Fury and many more. There is also a Bell 47 helicopter, the model of helicopter leading to the name ‘Chopper’ from the sound made by the rotor blades as they span around. 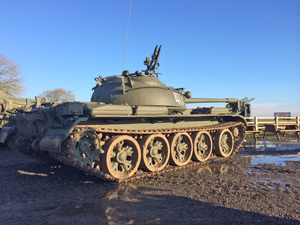 We have a Sherman tank- perhaps the most sought after tank of the period, a Centurion and a Chieftan tank to name but a few. The spectacular M4 105 Sherman Tank is with a rich history; the M4 Sherman is an American tier 5 medium tank, which was first produced in 1941 by U.S Army ordnance Department. The Sherman first saw combat in North Africa in 1945. The M4 Sherman was the main battle tank used in WWII by the US military and other Western Allied countries. When it comes to guns, the museum offers quite a selection to view; some hand held riffles in our interactive exhibition and other artillery guns, some self-propelled, several which sit on the top and back of flat bed trucks, tanks and other military vehicles. 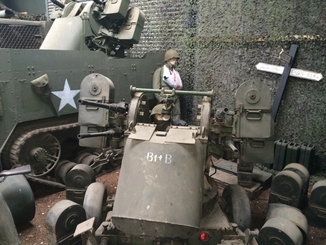 The collection includes the Krupp 105mm Howitzer, a 50mm Pak 38 and a Flak 38. 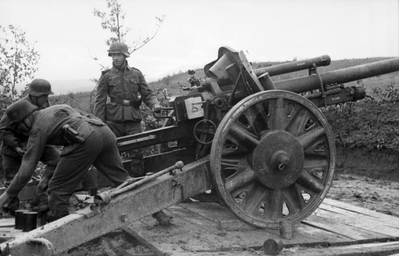 The Krupp 105mm gun was an evolution of the WWI field guns by German engineers as they prepared for the battlefields of WWII. When the Germans faced Soviet tanks in 1941 during operation Barbarossa, the Pak 38 was one of the few early guns capable of penetrating the 45mm armour of the T34 when equipped with Panzergranate 40 APCR shots and their tungsten core. Museum will help visitors to understand a little more of life for those who died to provide us the freedom that we take for granted today. We also hope that we are a bit more exciting than a history textbook for those studying WWII at school or simply to expand their knowledge. Every exhibit has an information article in front of it, often including a little about its evolution, military history and active duty. With news reel videos, working field telephones and Morse Code machines to play with as well as an AK47 and a rifle to pick up and hold, the museum at Armourgeddon is one of the best interactive exhibits in the UK. 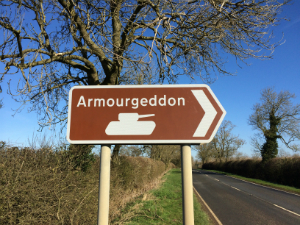 The Armourgeddon museum is open year-round, but out of the May to October open tank season, please book ahead. We can then inform you of any group bookings we may have on site when you wish to visit. 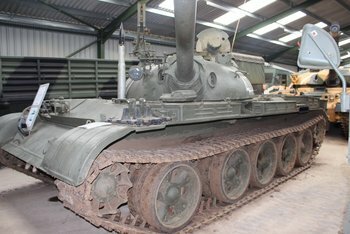 Planning your visit on days when we have tanks running will allow you a further insight into these magnificent machines. 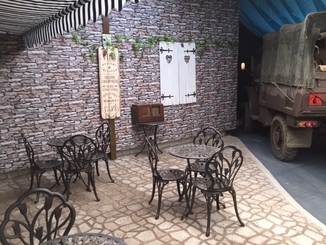 The Café De Normandie is a street scene café within the museum where you can sit and soak up the atmosphere as if in the 1940s of rural France, with a number of military vehicles parked up along the roadside setting. £6.00 per person - activity participants and under 5's go free! Fee includes entry to the spectator area, where on selected days you can watch some more of Armourgeddon's vehicles being put to the test. All children under the age of 16 years must be accompanied by an adult. Open for groups bookings only by appointment, please call 01858 880239. 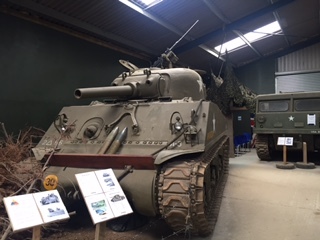 Come and take a look at our growing collection of historic tanks and military vehicles including a 1940's M4 105 Sherman Tank, it's all here on display! 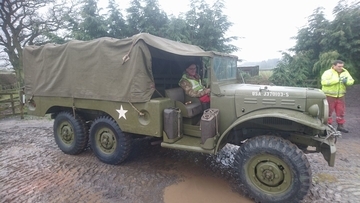 Meet the new arrivals at the Armourgeddon Military Museum as our Military Vehicle collection in the East Midlands grows further. 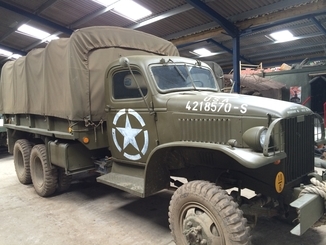 Landing from Germany, but originally US Army vehicles, read all about our new WC62 and GMC LeRoi. 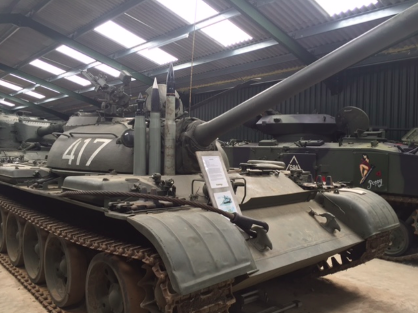 The T55 is one of the Russian army's mainstay tanks and now forms part of our 60+ vehicle collection at Armourgeddon Military Museum. 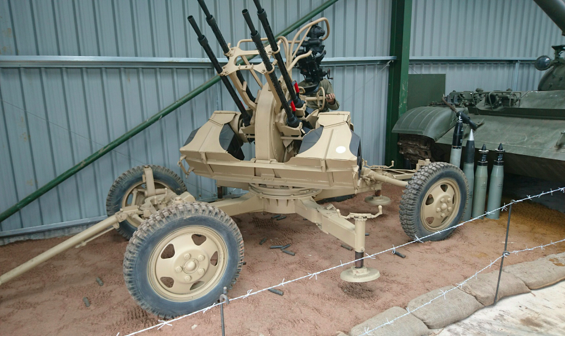 Our newest refurbished gun, a ZPU-4 is in place in our museum ready for the start of the season. Read on to find out more about this heavy machine gun with huge fire power. 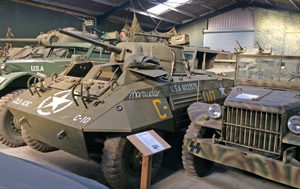 A great day out at the Armourgeddon Museum with plenty of exhibits including a Bell 47 Helicopter and an M4 Sherman tank. 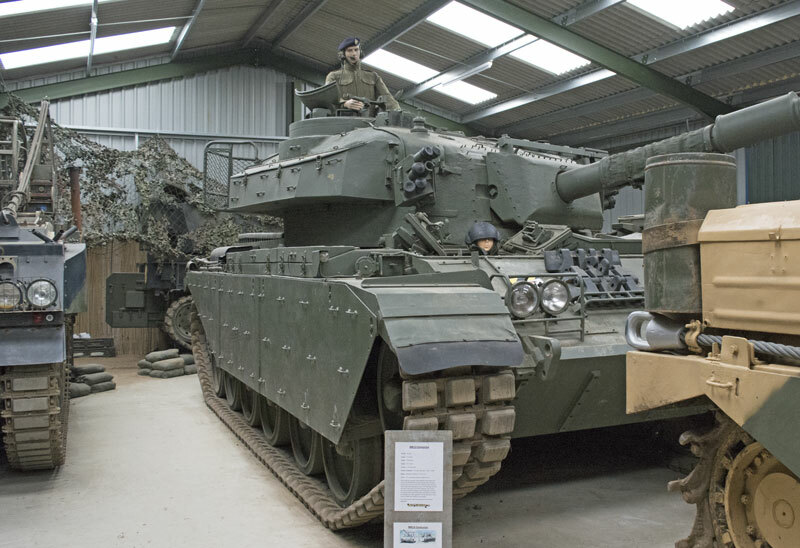 The Armourgeddon Museum- a living history of the life and times of World War II with a large number of interactive displays, tanks, military vehicles, guns, military paraphernalia and so much more. Incorporating Le Café De Normandie, read on for more information before you plan your trip to visit us. The T55; Russian warhorse, game changer of the Soviet war effort and quite a remarkable piece of kit, sits proudly within our newly extended museum at Armourgeddon. Read this weeks blog to learn about the T55 and her war impact. Ever sat wondering what design features make for an effective tank? Well if so, read on for the answer! If that question has never entered your mind, read on anyway- tanks are quite intricate in their design and totally fascinating! The grand unveiling of Le Café de Normandie has taken place this week with much jubilation. 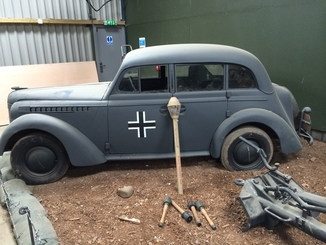 Read our latest blog about the Café and an update on the significantly increased museum at Armourgeddon- the culmination of a winter of work for the team on site. 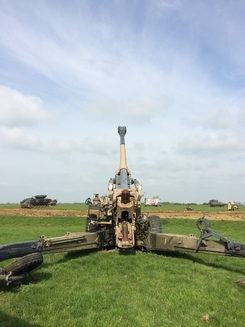 Having scoured Europe for a new gun for the collection, a rather dilapidated Krupp 10.5cm howitzer was found, transported and arrived here at Armourgeddon in December 2015 ready for the team to restore it to former glory. 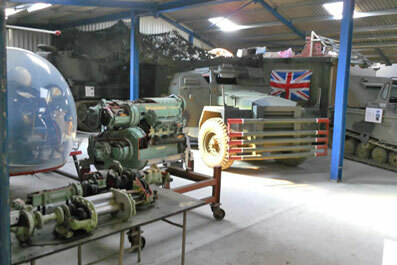 The Armourgeddon Museum is undergoing a face-lift during the coming months as we develop new attractions, re-organise the exhibits and create a space for post-WWII artefacts. After a grueling journey and many set backs through customs, a few months in the workshop and a paint-job, our new T55 is on display at Armourgeddon. Read more to understand the importance of this workhorse to many armies across the world. Had an enjoyable experience, well briefed by the instructor Roger. My partner and I had great fun and found our instructor, Craig, to be very friendly and knowledgeable. Would love to do it again!